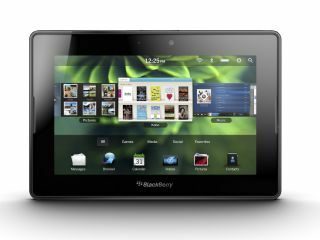 Slow out of the gate, the BlackBerry PlayBook is a promising business tablet that provides secure email, a good browser, true multi-tasking, and easy access to the device over Wi-Fi for file storage. Still, several apps are worth considering. These are the best free BlackBerry PlayBook apps from the ones currently available. The best PlayBook app by far, Adobe Connect Mobile, is a real standout. As long as you already use the Adobe Connect service, you can set up a webconference and tap into the room with a PlayBook. On the tablet, you can share your video form the built-in front-facing camera, collaborate on documents, instant message, watch a slideshow, and even view a shared screen from a computer. This app is like Pandora with more attitude. Once you select a "station" in a subgenre - like house or punk - you can stream the best and most recent songs on the device. Sound quality on the PlayBook is just average, but sounds much better over headphones. You can rate songs, view bios and lyrics, and create custom stations based on the artists and songs you like. Kobo is the only e-book reader available for the PlayBook, and it works just about the same as the Kindle and Google Books apps. You can purchase books using an intuitive interface that shows book covers and author details. The interface for flipping pages in an e-book also works quickly on the PlayBook's dual-core processor. Books tend to cost a bit more than they do on the Kindle, though. Viewers on a tablet are helpful for seeing an e-mail attachment. But the PlayBook includes a full editor called Word to Go. You can set fonts and formatting, set page variables like margins and indents, and add a bookmark to your text. The PlayBook keyboard is responsive enough for typing even longer documents, and makes a typing noise, but does not use haptics to buzz when you press a key. EA optimized this version of the popular racing game for the PlayBook - just make sure you get the latest update. There are 20 cars, including the Porsche Carrera GT, and controlling the vehicles works about the same as the Motorola Xoom and Apple iPad 2 - that is, you tilt to steer. The race modes - including one where you battle other cars on the highway, add some extra gameplay incentives. This shooting game is worth the free download if only to see the bright and clear graphics, and to hear the crunchy explosions on the PlayBook's tiny speakers. The gameplay is not that deep - you essentially fire rockets to stop incoming missiles, so it is all about timing and accuracy. The PlayBook does not support turn-by-turn navigation out of the box, but the Bing app provides very detailed street-level maps. Most importantly, the app works remarkably fast: we zoomed in to a London map and the screen refreshed almost immediately (take that, Xoom). You can view nearby businesses, get directions (by car, walking, or public transportation) and view current traffic. The Sheet to Go app on PlayBook is not quite as advanced as Word to Go - after all, you can't even make charts and you're limited to just three worksheets. Still, for business users who need to make a quick spreadsheet and calculate some expenses or work on your basic accounting, Sheet to Go is a helpful app. You can format text easily, and there's a Quick Format option for the cells. This game runs only in a vertical orientation and is essentially a cross between Bejeweled and Tetris - but it works. You shoot birds up into a grid, making sure to match the right colors. When you get three colors in a row, they explode. If you miss too many times or use the wrong color, the birds sink down on the screen. The audio - like birds in a jungle - is a bit repetitive though. Ranked low on our list only because the game is a bit simplistic (and at times way too hard), Doodle Blast has you drawing lines on the screen to direct falling marbles. You only get a certain amount of ink, although you can circumvent this by drawing quickly. We say Doodle Blast is "simplistic" because there isn't much else to do in terms of gameplay - but some levels are quite challenging.